Holly Park - The oversized master bathroom will take your breath away! MLS#3495566. Sycamore Properties Inc.
Anniston Grove - Exterior features include a large deck overlooking the private, heavily wooded and fenced back yard as well as a 3 car garage and irrigation on a large level lot. MLS#3494634. Berkshire Hathaway HomeServices Carolinas Realty. Brandon Oaks - Amenities include 2 pool areas complete w/water slide, clubhouse & covered cabanas, 2 tennis courts, stocked fishing pond & playground. Can do an extended close MLS#3493418. 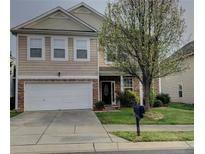 Keller Williams Ballantyne Area. Arbor Glen - Home is a 3 bedroom, but the bonus room could easily be converted into a bedroom. Roof replaced in 2017. MLS#3494981. Genesis Realty Company. Alexis Pointe - Refrigerator in garage does not. Investors Welcome! MLS#3493229. The Home Group of Carolina. Large rear entry 2 car garage with oversized parking area, cabinetry, utility closet, attic space and refrigerator hook up. MLS#3494600. Clickit Realty. Outdoors, you'll enjoy the spacious fenced yard, perfect for entertaining. Please schedule your showing today. MLS#3493665. Fathom Realty NC LLC. BRAEFIELD - Two-bay automobile Storage area! Fenced Yard! Storage Building! MLS#3494296. Helen Adams Realty. Tallwood Estates II - Spacious Secondary Bedrooms with Updated Jack& Jill Bath-Granite Counter Tops and Tiles Shower-the 4th Bedroom/Bonus is Upstairs.Large 2 Car Finished Garage-Other Amenities-Sellers are Non-Smokers-No inside Pets-Converted to Natural Gas in 2012-Architectural Roof 2013-A/C Replaced in 2016 -Union County Near 485 & HWY 601-See It ASAP MLS#3490305. Douglas Carson, REALTORS. Annandale - An airy sanctuary perfectly suited to a relaxed life-style awaits. MLS#3493511. Keller Williams South Park. Bent Creek - Two more bedrooms & a hall bath Room that has granite, tiled floor updated mirror & lights & more. MLS#3493409. Keller Williams Ballantyne Area. Lovingly maintained and ready for new owners! MLS#3493064. United Brokers Ltd.
Taylor Glenn - The yard is fully irrigated w 9 zones & professional landscaping. Roof 2018 MLS#3491257. Coldwell Banker Residential Brokerage. Lake Park - A must see!Pool access is via a separate annual pool pass that is not included in the HOA and is approximately $275 for family per season. Check out website: lakeparknc.gov MLS#3493016. Allen Tate Matthews/Mint Hill. Blanchard Estates - Long Driveway, 3-Car side load garage, Leveled yard, 15-min to CLT! MLS#3491036. Keller Williams Ballantyne Area. Brandon Oaks - Walk to theater, shopping & dining or enjoy a glass of wine on your deep front porch. Agent related to owner. MLS#3492312. Teel Realty. Brandon Oaks - The bonus room is oversized with a double closet and attic storage. Hurry! MLS#3492467. Coldwell Banker Residential Brokerage. Taylor Glenn - Low HOAs, Union County Taxes & Schools makes calling this place home a no-brainer. See you soon! MLS#3491230. RE/MAX Executive. Crismark - It is located conveniently to many amenities, including shopping, entertainment and has an inviting clubhouse and pool. MLS#3492407. Southern Homes of the Carolinas. Brandon Oaks - This open plan is perfect for today's lifestyles and for entertaining. MLS#3491041. Engel & Völkers Uptown Charlotte.